As a resident of Shillong whose family have benefited so much from NEIGRIHMS, I am forever grateful and indebted to this hospital that helped my sister, recover from a life endangering ailment. We are especially grateful to the staff and doctors of Urology department including Dr Sailo, Dr Lakiang and Dr Alkesh for their relentless hard work and selfless dedication to give the best possible care to my sister. It is because of them that my sister is alive and well today. Our family has been struggling to find the best Urology and Nephrology care for our dearest sister for a long time and we had gone hopping from one hospital to another, including hospitals in Guwahati, but to no avail. Her situation worsened and we had lost all hope; drained physically, emotionally and financially. It was at this hopes’ end that we decided to consult Dr Sailo from the Urology department in NEIGRIHMS. My sister having been admitted in NEIGRIHMS for more than 8 months began to show progress steadily. Now my sister is completely healed and is eagerly fulfilling her life’s ambitions and dreams all thanks to NEIGRIHMS. NEIGRIHMS is a premier Institute housing the best facilities and staff that are dedicated to serve, ready to give their best and are well educated with loads of experience. This Institution was specifically set up to help residents in the region get the best of specialised care nearer home instead of wasting time, energy and money in getting their loved ones treated outside the region which as we all know can be excruciatingly exhausting in every aspect. Against this backdrop, it saddens me to hear about the mismanagement and administrative failures of NEIGRIHMS. The concerned Ministry in the Central Government should intervene to save the Institute and if there is genuinely a leadership issue as portrayed, then necessary steps should be taken so that the growth of the Institute as a super speciality care destination is not compromised. There is an increasing rush of patients coming from outside the state to NEIGRIHMS primarily to seek the services of the super speciality departments such as Urology, Oncology, Cardiology etc. Sadly, however, the trend among the local people in Meghalaya is to rush outside the state for the same services that NEIGRHMS has to offer. We are yet to understand its true value and potential and most lack good faith in its progress and capabilities. Such administrative failures and mismanagements will further dent the confidence of the local population in the Institute. Also, there is a small percentage of privileged locals, who have the means to seek specialised medical care outside the state, who are discouraging and bad mouthing NEIGRIHMS to the less fortunate and taking away their trust in an Institute that could possibly be their best option given their financial status. Our family believes in this Institution and without a doubt it did not disappoint us. We will constantly rally around the benefits of having this leading medical institution at our hometown and at this time of crisis it needs our support in keeping it up and running for generations to come. The construction work for the proposed AIIMS, Guwahati has already begun and I fear that the best bunch of medical experts from NEIGRIHMS will prefer to relocate away from our State and provide their services elsewhere, where their expertise and decisions are better recognised and better accepted. With good administration and recognition, I am sure NEIGHRIMS will scale new heights so as to be able to provide the best health care to people of this region at affordable prices. Reading the caption “MDA appoints 5 advisors in six months,” (ST Oct 5, 2018) one would like to begin by asking the question: Will the Conrad led government be different from its predecessors? Well we had great expectations that it would. 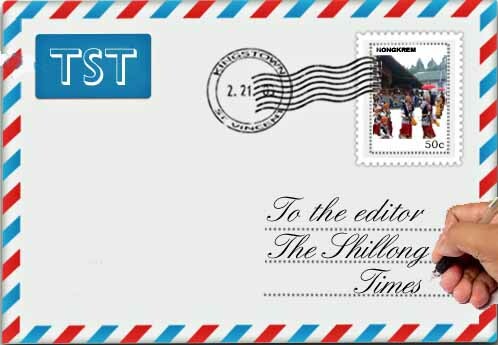 We had hopes that the people of Meghalaya will be ushered into something new and positively different. But on reading that the NPP-led MDA government has even superseded the previous Congress led MUA – II in appointing 5 advisors to the Government in six months our hope and faith are shaken and may be belied. Alas! For s State that faces financial crunch to pay the teachers their salaries, are these political appointees really needed? The saying “Too many cooks spoil the broth” does not seem to fit the bill here because it is a case of “The more the merrier” that works. While things cannot change overnight with the coming of a new government, one fears that things may never change (for the better) at all. After all, besides a few new players, the present government has old and seasoned players who are well versed with the game of politics and what a life of luxury and power mean. Certainly, its a herculean task that the Conrad government has to address. Them Iew Mawlong, Health and Sanitation, Roads, Education, Traffic, Youth and Unemployment, unfinished Projects, and lots more! Sadly, the trend seems to be the same – personal interests first; public interest last. The media has highlighted the visit of Meghalaya Assembly Speaker, Dr. Donkupar Roy to Ranikor Constituency on October 6, 2018. The report said he was accompanied by the local MLA, Pius Marwein, Health Secretary,Pravin Bakshi, Secretary PWD, Paul Marwein and other officials. He inspected the road from Balat Bifurcation-Umpung- Panchiring-Ranikor-Rajaju- Nonghyllam-Nongjri-Khonjoy up to Moheskola, Ranikor CHC, Khonjoy PHC and Moheskola IB which are in shambles. Dr Roy has issued strong instructions to the officers of the respective departments to immediately take corrective measures so that the whole stretch of the road should be set right by necessary repairs, metalling and blacktopping; that the CHC. PHC and the Health Sub-Centres should be made functional and repaired wherever required. The other good outcome of the inspection was the decision to post doctors and para-medical staff at the health institutions, particularly at the Khonjoy PHC which remained without doctors and staffs for several years, and that the Sub-Centres at Moheskola and Giligora be made functional. Again he has instructed the PWD to immediately repair or reconstruct the Inspection Bungalow at Moheskola. The Officers of the concerned departments have assured the Speaker in the presence of the local MLA that they would carry out the tasks at hand. Not only that, the Speaker and the MLA, while addressing the local people there, have assured them that the roads and health delivery system would be taken care of expeditiously. From what I can judge, the visit of the Speaker, the MLA and the officials was a huge blessing to the people of the constituency if the assurance is fructified. I request the Speaker to make such visits to constituencies of the State which are still backward in many respects, including his own.